Keton Kakkar, a current senior at Swarthmore, interviews his parents who emigrated from Afghanistan almost 40 years ago. Part of the Hindu minority in Afghanistan, they fled persecution and a new upheaval: the Soviet invasion of 1979. In this episode, Keton explores themes of changing landscapes, religious identity, emigration, and relocation. Climate change poses an existential threat to coral reefs, which undergird the survival of many marine animals and the livelihood of coastal communities. In this podcast, we turn our attention to two reef scientists: how do they approach research when the world they study is degrading before their eyes? Our host, Ben Charo, begins this episode discussing his journey to produce this story. If you would like to skip to the main story, go to 4:30. At the end of the piece, Ben shares the stories and insights he has gleaned from his fellowship research in Townsville, Australia. This piece was produced by Ben Charo, Katherine Kwok, and Serena Sung-Clarke. We’d like to shout out to Meagan Currie, Jake Stattel, and Kyle Richmond-Crosset for their help. Our background music is by Blue Dot Sessions (via Free Music Archive). The news clips are from BBC, ABC Australia, and PBS News Hour. The sound effects are by HDvideoguy, LittleRainySeasons, and Kinoton via freesound.org. Special thanks to Dr. Scott Heron and Zack Rago. Photo was taken by Ben Charo. The now four year long civil war in Yemen has devastated the Yemeni people killing almost 100,000 people and leading to widespread famine. We take an in-depth look at the politics and history surrounding the conflict and how that has produced one of the most extreme humanitarian crises in the world. This podcast explores the current state of the Yemeni Civil War speaking with Fatik Al-Rodhani, a Yemeni journalist and humanitarian activist on the ground in Sana’a. This piece was produced by Jaydeep Sangha, Nick Hirschel-Burns, Yusa Parcali, and Lisa Kato. Small farmers in the northeast of Madagascar produce 80% of the world’s vanilla. Due to a series of factors, including climate change and market liberalization, these farmers are experiencing extreme fluctuations in the value of their crop. This podcast explores the causes of those fluctuations and the strange and surprising impacts the boom and bust cycle has on the people of northeastern Madagascar. This piece was produced by Kyle Richmond-Crosset, Serena Sung-Clarke, Shiloh Sumanthiran, and Juliane Ding. Selected music was obtained through the Free Music Archive. Hundreds of thousands of Rohingya refugees have flooded out of Myanmar, escaping from military violence. Escaping from Myanmar in itself is a harrowing journey, but many refugees continue to find adversity in the camps and cities where they end up. In continuation from the first part of this series, we speak to a PBS reporter, a United Nations advisor, and the director of a refugee rights organization. With their help, we try to understand the journey faced by Rohingya refugees, from fleeing their homes to trying to resettle in a new one. This piece was produced by Serena Sung-Clarke, Jasmine Rashid, Jia Chern Teoh, and Katherine Kwok. The background music in this episode was produced by Podington Bear from the Free Music Archive. As part of a project connecting to Professor of Political Science Emily Paddon-Rhoads’ class on the Politics of Sub-Saharan Africa, several Swatties examine the role of music in Ugandan politics. Ugandan President Yoweri Museveni has been in power for three decades and has pushed the presidential age limit. In this troubling context, musicians take varying degrees of political engagement but are all restricted in their methods of expression by the government. How have artists responded? Some completely avoid politics; some see artistic expression as a mode of social activism. 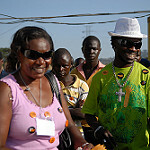 A number of musicians sang for Museveni’s campaign. Others ran for office to create change from within the system. Ugandan pop music reflects the disturbing trends of Ugandan politics. This week on War News Radio, our reporters Ozsu Risvanoglu, Lea Slaugh, and Sally Wang, with the help of Lisa Kato and Seimi Park, will take you on a journey with the music of parliamentary musician Bobi Wine (also known as “The King of Ghetto”), top musician Eddy Kenzo, and human rights activist/musician Bana Mutibwa.